at 143 W Street Northwest, Washington. The development was completed in 2018. Sales for available units range in price from $1,329,900 to $1,329,900. Beale Square has a total of 5 units. Sizes start at 2558 square feet. 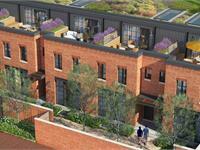 Beale Square offers 5 row homes designed for the contemporary, urban lifestyle. Experience Bloomingdale and all it has to offer, with accessibility to restaurants, bars, transportation and downtown DC. Your inquiry will be delivered to the Beale Square sales team, who will send you more information about this development.